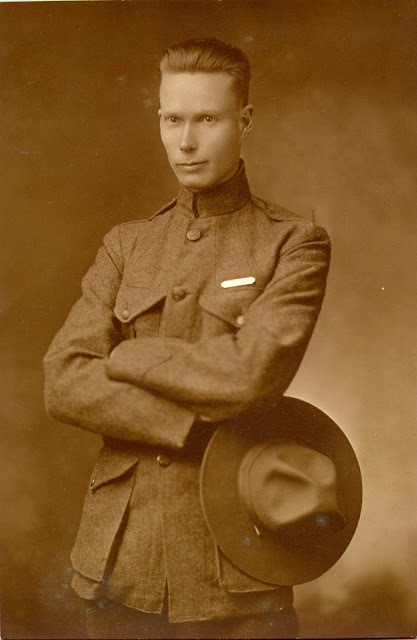 My grandfather, Lyle Lawrence Carringer, was born 124 years ago today, on 2 November 1891 to Henry Austin and Della (Smith) Carringer in San Diego, California. He saw so much in his lifetime of 85 years, and enjoyed almost every minute of it, often expressing awe and wonder at nature, engineering feats and science. I believe that he had a wondrous life. 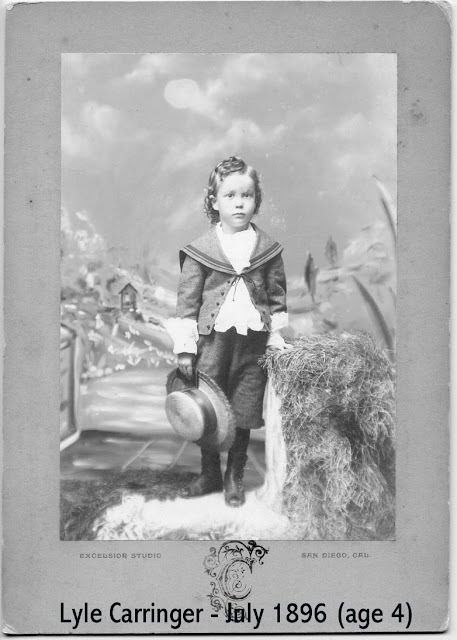 Lyle was over-protected as a boy because his parents had lost a baby boy in 1890. His parents built a house on 30th Street in San Diego and owned most of the block. He learned from the school books of his parents - the McGuffey's readers and almanacs - and attended school, graduating from San Diego High in about 1912. Here is a picture of Lyle as a boy of 4. Check out the hair and the outfit. Lyle was curious and inquisitive, and as a boy and teen he explored San Diego and environs on foot or on his bicycle, and on the trolley that ran down 30th Street to downtown. He attended Sherman School and San Diego High School, graduating in 1913 at age 21. He started working at age 14 in 1906 as an errand boy at Marston's, a downtown San Diego department store, and learned how business worked. He had met, and then married in 1918, Emily Kemp Auble and they soon had a baby - my mother, Betty, in 1919, who was an only child. Soon, they built a house on the same block (2130 Fern Street) as his parents and settled in, with Emily's mother, a widow. The book case in the home was full of popular novels, travel stories, popular magazines and the encyclopedia. Lyle progressed at Marston's and eventually became the accountant and the paymaster for the store. Here is a picture of Lyle, Emily and Betty in 1919. Like most people of the time, he had his own account book to tally his income and his expenses. Four of these books still exist - from about 1920 to about 1945. In them, he counted the eggs collected from the henhouse and sold, the daily expenses at the grocery store, his income and bank deposits, the trials, tribulations and expenses of driving and maintaining the car (tires were very fragile, the roads were terrible), and details of where they drove and with whom they visited. The details are fascinating - to me, at least. On the home block, there was always plenty to do. More houses were built for rental, and his parents house was moved from the corner to the center of the block. Repairs to the homes and rentals were endless, furniture was bought, sold or scrapped, gardens were put in and tended. I have rental agreements, rent receipts, home repairs and appliance purchases for the years 1940 to 1975. Excursions to Balboa Park, La Jolla, the beach, Tijuana, or the mountains were weekly occurrences. There were cousins in Whittier and Long Beach, and they often visited them, stopping at Knotts Berry Farm in Garden Grove for dinner. The family took several long road trip vacations - going all the way to Victoria BC one year - and the journal tells all about it (where they stopped, who they visited, how much things cost, etc.) - fascinating! My mother married in 1942, and I was born in 1943, my first brother in 1946, and my second brother in 1955. My father went into the Navy in August 1944, and my mother and I moved back in with her parents. My grandparents doted on me, told me stories, took me places, and let me explore my little world. My grandfather had a movie camera, and I have many 8 mm films of my early childhood (which still need to be transferred to DVD). I believe I got my love of history, geography and family from my grandparents - nurtured in my early life by time spent with them. 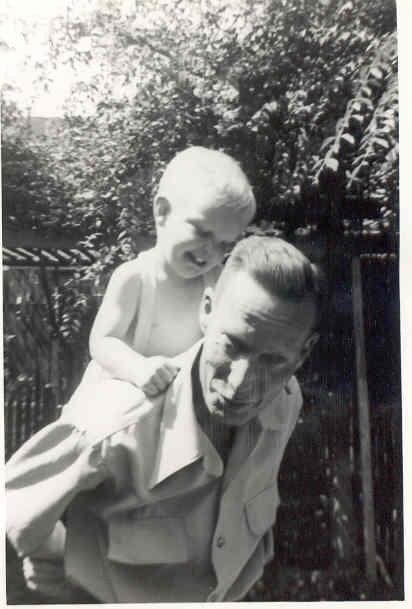 This is a picture of Lyle and his grandson Randy in 1945 - obviously happy to be so high up in the world. After his parents died in 1946, Lyle inherited the whole set of property. He and Emily moved into his parents home and sold the Fern Street home and the vacant lots on the south end of the block (which was our ball field playground). With these proceeds, they bought a small parcel of land on Point Loma with a postcard view of San Diego Bay. They built a home on the lot and moved into it in 1951. This home became our Christmas haven - since it had a fireplace, and we spent many happy Christmas Eves snug in our makeshift beds waiting for Santa to visit us. Gramp took us fishing on Shelter Island on San Diego Bay, out to the end of Point Loma to visit the lighthouse, and explore the tidepools, or we climbed the hills and explored the canyons near their house. He had always collected stamps and had many overseas correspondents. He went monthly to the Post Office to buy sheets of new stamps, and often gave plate blocks and single stamps to my brothers and I for our collections. Lyle finally retired in 1961 after 55 years at Marston's, and settled into his retirement. He still came over to the 30th Street property and worked on the buildings and the gardens, and to see his daughter's family and to talk to his grandsons - to hear about their education and exploits and dreams. He was so proud that his daughter and grandson had attended and graduated from college. 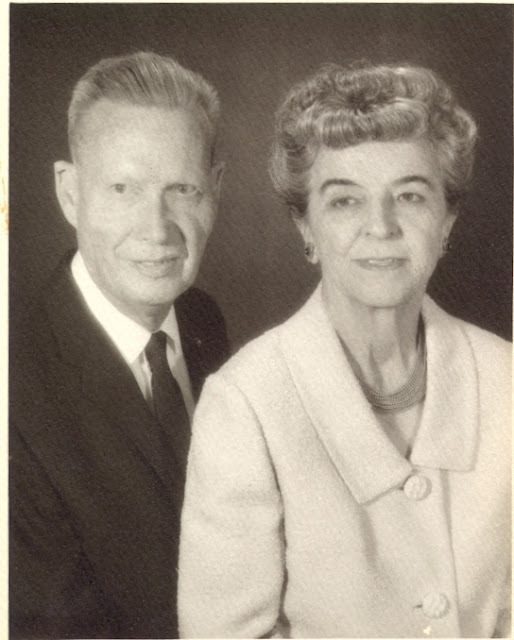 Here is a photo of Lyle and Emily in about 1970. He succumbed in November 1976 to colon cancer, and his dear Emily joined him soon after in June 1977. Their deaths pained me, but became the catalyst that made me examine my own life and beliefs, and firmed up my life's goals. My grandfather was the most moral, upright and intelligent man I've ever known. He spoke quietly, listened well, was a fountain of wisdom, and enjoyed good humor. He never lost his sense of awe and wonder. He had no religious training or beliefs because of the way his parents grieved over the loss of his baby brother in 1890. 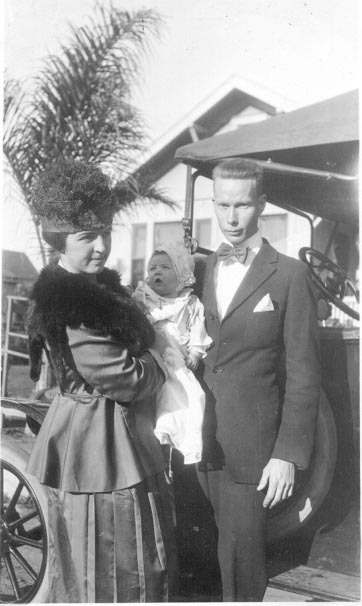 During his life, he witnessed and experienced - either in person or via newspapers and TV - the development of the automobile, the movie camera, running water and toilets in the home, the washing machine, dishwasher, and refrigerator, dirt streets to paved roads to interstate highways, telegraph to radio and television, barren scrub land to Balboa Park to a classical city park, creation and development of the San Diego Zoo and Palomar Observatory, gliders to airplanes to blimps and rocket ships, Sputnik to Mercury to Gemini to Apollo to the moon landing, war (Spanish-American, WW I, WW II, Korean, Vietnam), peace, boom times, recession and depression times, 16 Presidents, a 58 year marriage, the birth and growth of a daughter and three grandsons. It was a wondrous life. The best thing he ever did, perhaps intentionally or perhaps subconsciously, was to spend endless time with his family - wife, daughter, grandsons and friends - telling them stories, listening to their stories, hopes and dreams, playing board or card games, and encouraging everyone he met to be a good person - to be the best they could be. We always called him "Gramp" and we always went over to "Gram and Gramp's house." I think my mother called him Dad and my father called him Lyle. His legacy was threefold. One was financial - the real estate holdings that he built up over his lifetime provided a decent retirement for him and Emily, and for my parents, and an excellent inheritance for my brothers and I. More importantly, the legacy of kindness, love, thrift, and happiness provided a wonderful example to his grandsons. Lastly, there was the wonderful stash of family history material - papers, books, photos, movies, and memories. I miss him greatly. I wish that I could have him back for just a month or so - to ask him questions, to hear more about his family, his life and experiences, to thank him for loving me and molding me and providing the impetus to study genealogy and family history. Thank you, Gramps for your rich and diverse ancestry. I know you would enjoy knowing about your ancestors beyond the ones you knew - the German immigrants to New York and Pennsylvania, the English immigrants to New England and New York, the Dutch and French immigrants into New York, etc. Who do you miss the most? Who had a wondrous life in your family? Who loved you and molded you? Tell me about them - please? Better yet, tell your children and grandchildren about who you miss most. What a well written and lovely way to honor your grandfather Randy. My grandparents were all born between 1882 and 1888. So they saw similar changes in the world around them. I have some memories of them, but not as many. You are blessed to have spent so much time with yours. I do cherish the memories I have, which were with my grandmothers as both my grandfathers were gone by the time I was 10. I agree, what a nicely written, sentimental family story about your Gramps.